Court of Appeals Judge Sean Tindell has served as a Senator, prosecutor and counselor, but the title he likes most is coach. Coaching children in sports is an opportunity to teach leadership, good conduct and good competition. “I challenge all of you to take time” in shaping young people’s lives, he told a courtroom packed with colleagues, friends and family at his April 18 investiture in Bay St. Louis. Judge Tindell currently coaches three baseball teams: the Astros, on which his son John Thomas plays; the Red Sox, on which his son Sam plays; and a travel team, the Gulfport Generals. In the past, he coached basketball and flag football. He coached before he had children of his own. Court of Appeals Chief Judge L. Joseph Lee convened the Court of Appeals at the Hancock County Courthouse for the investiture during the first day of the Trial and Appellate Judges Conference in Bay St. Louis. It is traditional to hold an investiture ceremony at a later date after a judge is appointed. Judge Tindell, 44, of Gulfport, took the oath of office Oct. 17, 2017, after Gov. Phil Bryant appointed him to the vacancy created by the appointment of Judge David Ishee to the Supreme Court. Tindell previously served for six years as a Senator from Harrison County’s District 49. The Lieutenant Governor said that he was impressed with Tindell and appointed him to lead the powerful Senate Judiciary A Committee. “It was very evident that he had the temperament and the skills to lead,” Reeves said. Judge Tindell thanked many people who shaped his life and career. He recalled making plans to start a law practice with Will Symmes, one of his best friend since age 13, while both were students at Mississippi College School of Law. “And we did it.” He thanked former clients who allowed him to expand his legal knowledge and practice law in courts across the state. He recognized former legislative colleagues “who are down in the trenches trying to do good for the people of the state of Mississippi.” He thanked law clerks Lindsey Watkins and Kelly Cash, who assist in the work of the court. And he thanked organizers of the investiture including Judicial Assistant Heather Graves, Hancock County Circuit Clerk Karen Ruhr, Assistant Court Administrator Camille Evans and his cousin, Linda Mizell. Judge Tindell’s voice cracked as he talked about his strongest influences, his family. As a single mother, Dora Harvey of Biloxi worked as a court reporter for the Harrison County Court. “I learned to fall asleep to the sound of a typewriter” as she prepared transcripts of court proceedings. Later, he would sneak into the courtroom and talk into the microphone, pretending to be a lawyer. Dora Harvey’s confidence in him encouraged him to go to law school. 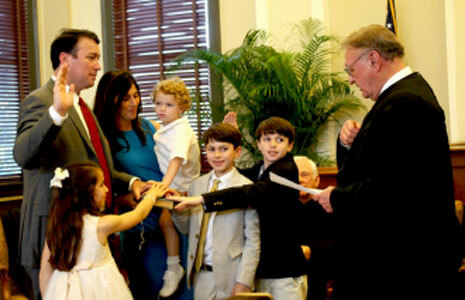 Claire Tindell held youngest son Henry in her left arm and the Bible in her right hand as Judge Tindell prepared to take the ceremonial oath. As Judge Tindell laid his hand on the Bible, the children, Sam, John Thomas, Meredith and Henry, each placed a hand on his.